In the museum they had people playing Viking characters and a couple of them did an excellent job. We learned to play Hnefatafl (pronounced nef-tafle which means ‘Knave’s table’). It’s played on a 13x13 square board and the attacker has 24 knaves while the defender has 12 knaves and one king. Knaves can move as many spaces horizontally or vertically as they wish until they run into an edge or another piece. The king can only move one or two spaces at a time. The object is for the defender to get their king to one of the corner squares and for the attackers to capture the king. Knaves are captured by surrounding the captured knave on two opposite and adjacent squares. The king must be captured by surrounding him on all four squares (unless the King is against an edge). For purposes of capture and movement the courners are assumed to be occupied by white. Strategy for the attacker involves first defending all the corners. 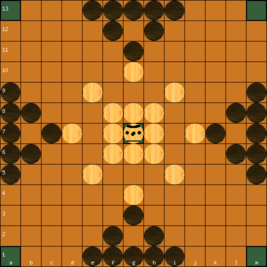 The white (defender) pieces start in a diamond shape surrounding the king on the center square. The browns (attackers) start in four groups of six: on each side of the board five men are centered along the side, then on man sits in front of the others in the center of the group. It sounds like an odd variant - the large board and the slow king would make for long and possibly tedious games, and I can't see how the king has any hope of reaching a corner before the attackers block them all off! I met some folks from Jorvik at a Viking Festival once, they explained their rules to me and I remember they sounded unfamiliar (I only knew the Fetlar rules in those days!). Incidentally, it had never occurred to me before that the mysterious word "Hnefi" could be cognate with "Knave" - Sounds plausible, and I also found this etymology for "Knave" (n.) O.E. cnafa "boy, male servant," common Germanic (cf. O.H.G. knabo "boy, youth, servant," Ger. knabe "boy, lad," also probably related to O.E. cnapa "boy, youth, servant," O.N. knapi "servant boy," Du. knaap "a youth, servant," M.H.G. knappe "a young squire," Ger. Knappe "squire, shield-bearer"). The original meaning might have been "stick, piece of wood" [Klein]. Sense of "rogue, rascal" first recorded c.1200. In playing cards, "the jack," 1560s. Am I imagining it, or did that etymology suggest that "knave" might once have meant a piece of wood... a gaming piece, for instance...? Hnefatafl - The Viking Game ... Hnefatafl dates from the Viking period, and although much of its history is patchy, much has now been discovered through archaeology. The game includes a cloth printed board and cast figures for the playing pieces, plus full rules and instructions for play. Suitable for ages 10 and up. I love the hilarious picture, which suggests they have no idea how to play.... probably just the photographer in a hurry. in the comments below, someone wrote: I used to play games on that very table as part of my job at Jorvik. Great times! ...the rules are very simple. All the pieces move in the same way (like a rook in chess), though in some variations the King (big piece in the middle) can only move one square at a time. His side win if he reaches a corner square and the others win by surrounding the King on 4 sides. 13x13 set in use in Jorvik Viking Museum, York, UK. They sell the standard History Craft 11x11 set in the shop, however. This 13x13 game was tested: king armed and captured from 4 sides, wins on edge. Such rules were found not to work, the defenders always win. 3 types of king (unarmed captured from 4 sides, armed captured from 2 sides and armed captured from 4 sides). 2 types of wins (edge or corner). This makes 30 possible rule combinations, too many to test them all. Any suggestions for, which combinations might be good candidates for balanced tafl games? It's no surprise to me that that combination of rules didn't really work: it's the same old-fashioned combination dating back to H. J. R. Murray that similarly fails to work on 11x11 and 9x9 boards (not to mention 7x7). If your trial of the cross-shaped 11x11 sea battle tafl shows an improvement in balance of that game, then I think the sea battle rules would probably work well with this size and starting layout too: the common factor is that the defenders have full ownership of two ranks and two files at the start of the game (or put another way, there are defenders that can reach the edge on the first turn). Another good one to try out may be the Linne tablut rules, if the trial tournament is successful. These have the advantage of authenticity, if the emerging consensus turns out to be correct. In both cases I'd recommend 49 pieces, so that the board has a similar ratio of pieces to open space as the 9x9 and 11x11 boards (about 30%). With 37 pieces I think that the king's task would have to be made much more difficult. I think that one thing that makes these larger games favour the attackers is the closed formation that people often adopt for the defenders, hence me going on about using "cross shaped" layouts above. People have been pointing out for a number of years that the king's defenders are a hindrance as well as a help, and their formation is signficant. They need to be able to seize control of a certain amount of the outer board if they're to stand a chance - but obviously not too much of it or balance sways the other way. A game with an expanded castle might work, but it would need to be marked out on a board in order to make it clear what squares are protected. That's fine for electronic games and new boards, but still leaves me wondering what game was played on boards like the Bergen and Toftanes 13x13 boards where only the single central square is marked. I'd prefer to find a starting layout that works without the need for extra innovations or board markings if possible. All of the 13x13 starting layouts we have are modern, so history is neither helping us nor holding us back there! Perhaps not fully proved, but it's my strong impression, that strong king variants work only on the 11x11 board. On smaller boards the defenders always win, on larger always the attackers. Then there's the Magpie 7x7, which works only because the strong king is limited to one step per move. In contrast to this, the weak king and the sea battle king are scalable and work on many board sizes. Hagbard wrote: Perhaps not fully proved, but it's my strong impression, that strong king variants work only on the 11x11 board. [...] In contrast to this, the weak king and the sea battle king are scalable and work on many board sizes. This doesn't surprise me, as the strong king is just a mistranslation of the Linnaeus source. The play-testing done on the site so far, along with the historical sources, seems to indicate that if a "standard" hnefatafl existed, it would have had a weak king. cyningstan wrote: This doesn't surprise me, as the strong king is just a mistranslation of the Linnaeus source. The play-testing done on the site so far, along with the historical sources, seems to indicate that if a "standard" hnefatafl existed, it would have had a weak king. Since archaeologists found tafl boards of sizes 7x7, 9x9, 11x11, 13x13 and 15x15, then if a historical tafl game was played on all those boards, it follows that the historical king could not have been a strong king (strong = armed and captured from 4 sides).